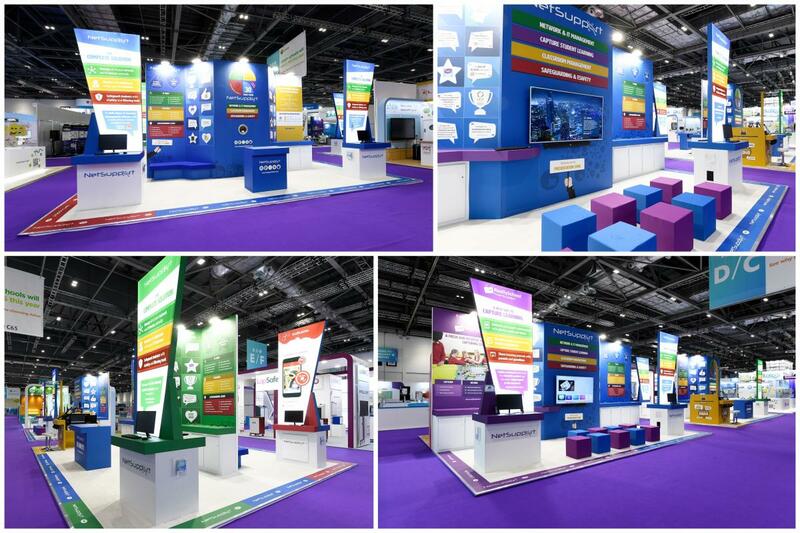 What is the best exhibition stand solution? We examine the pros and cons of portable displays, large self-build exhibition stands and bespoke exhibition stands that come with installation and breakdown services. At the budget end of the portable displays is the reliable roller banner, or sometimes known as a pull up banner. The simple cost effective design is ideal if you are looking for a freestanding graphic solution that is low cost and can be produced as and when your promotion or key messages change. The roller banner comes with its own bag and is available usually as a 2m high display available in widths from 800mm to 2000mm. Hugely popular are the stretch fabric displays. The freestanding stretch fabric banners and walls are made with push fit tubular frames and one piece fabric socks. The fabric socks can be printed single side (with a plain back) or double sided and are pulled over the built frame and zipped closed along the bottom to provide the tension needed. If your budget allows you could opt for a back lit stretch fabric display, which is in principle the same system as the aluminium frame with fabric sock, but with the added illumination of a LED curtain within the frame to make your brand and message stand out. 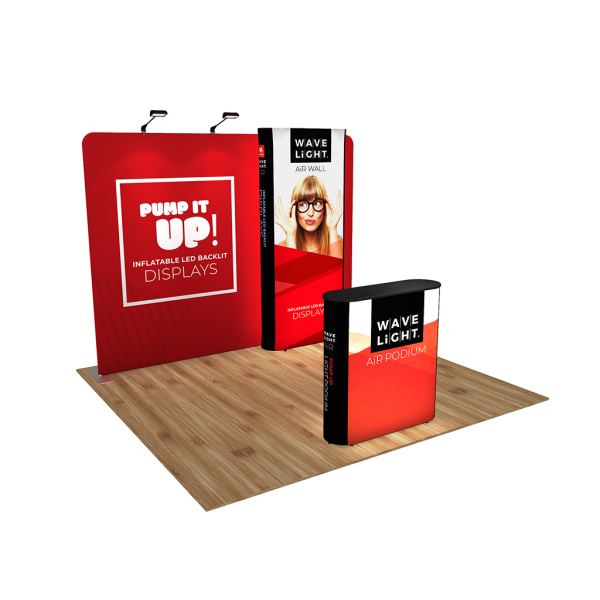 If you are looking for a portable display that is even easier to install then look no further than our inflatable stretch fabric displays, this time with built in LEDs for an easy to build, transport and illuminate exhibition solution. Couple with an inflatable back lit counter for the ultimate easy to build portable exhibition solution. 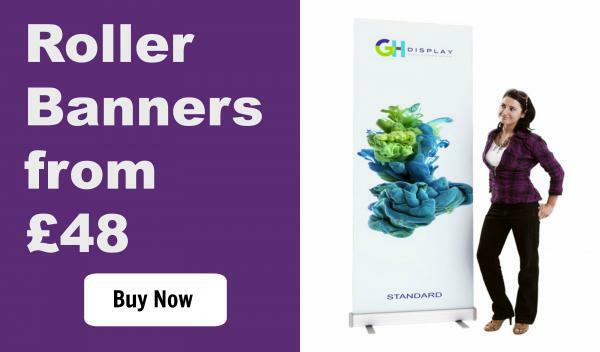 For the business who are looking for an exhibition stand that has more to it than a one piece portable display stand there are various options that range in design options, adaptability and ease of use. 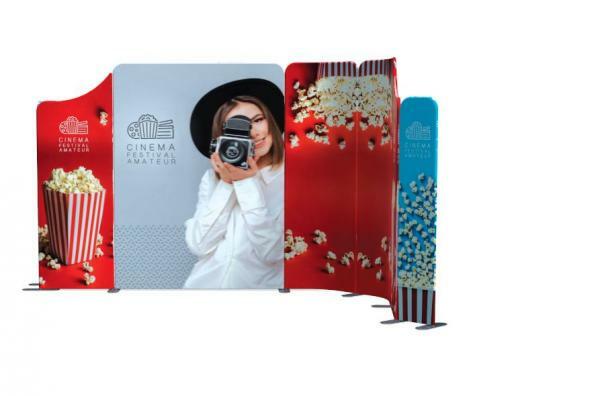 If you are in need of a display stand that is still relatively portable and simple enough to be self-built than you can't go far wrong with a stretch fabric custom modular display solution. These simple to build display walls can be connected together with either joining feet and clamps or more recently introduced to the market, is the Modulate walls with their magnetic frames connecting one display to another. Essentially any size or layout can be achieved by simply mix and matching the different individual display walls. Whichever ever system you opt for, both are based on the same principles of strong aluminium push fit frames and single or double sided stretch fabric prints, each one zipping closed to create the tension needed. 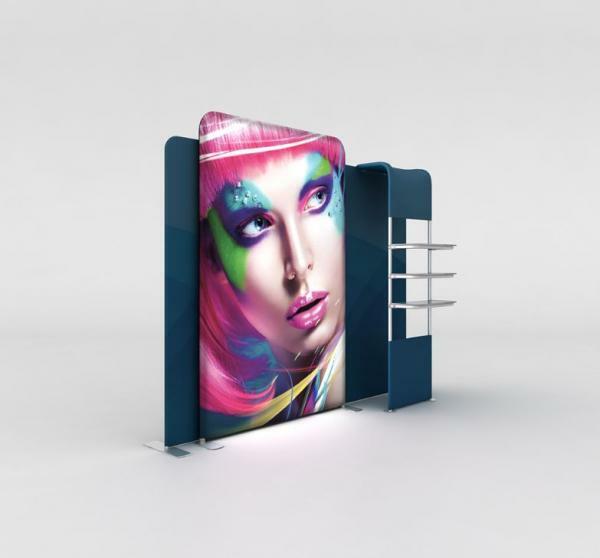 They are all supplied in bags and come with many display options such as branded counters, product displays shelves, TV, iPads and literature holders. 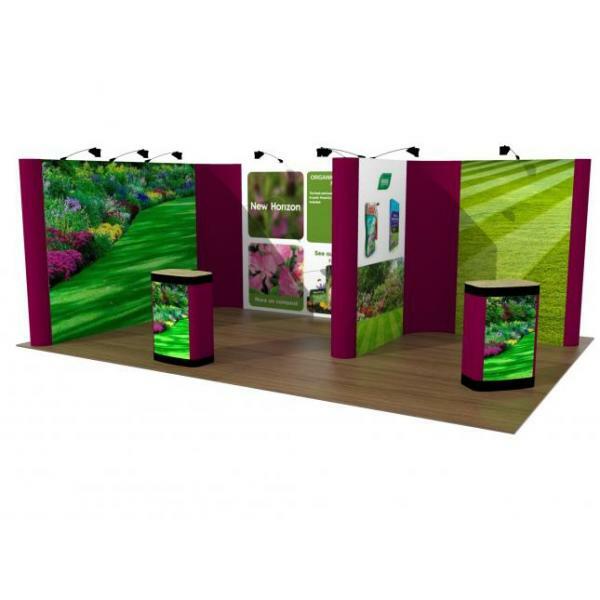 Another versatile and popular self build option is the classic pop up exhibition stand, but with the added twist of being connected to other pop up displays to create a larger more custom stand layout. 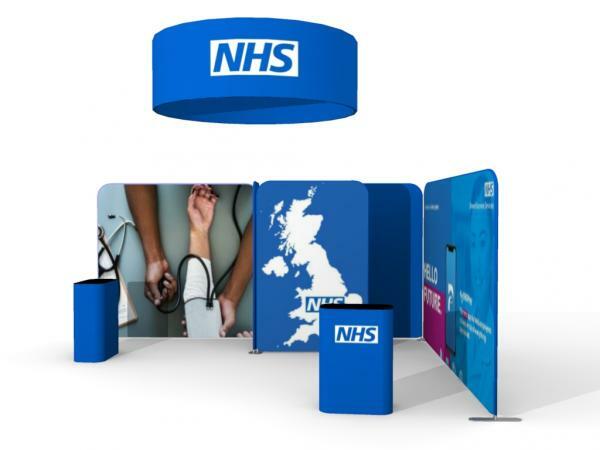 The Linked Pop Up Exhibition Stand can be designed to create a huge range of layout and sizes using the 3x1, 3x2, 3x3, 3x4 and 3x5 straight and curved pop up displays. Each individual pop up display stand is linked to the other with a ghost or linking graphic panel. The stands all come supplied inside a wheeled case for easier transportation and secure storage. If you have the budget than a custom or bespoke exhibition stand with installation and breakdown services is by far the best option for a stress free and eye-catching exhibition display. With our free exhibition stand design service and professional team of carpenters, stand builders and graphic printers we can create an eye catching and totally custom display stand for your brand. Our custom stands with install and breakdown services start from as little as £7k so even small marketing budgets can stretch to a bespoke exhibition stand experience. Browse our portfolio or complete our design form below and we can start working on a design concept for your next show.